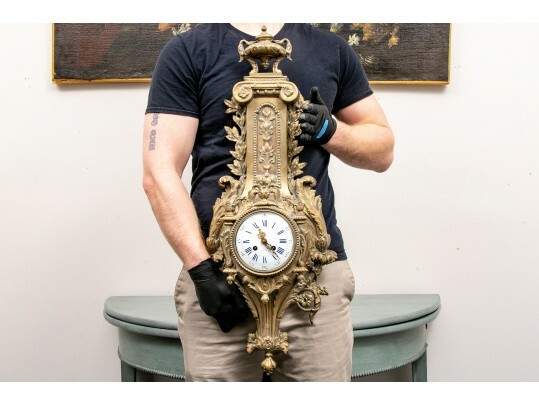 Elaborately cast clock with an urn finial over a scrolled capital and floral leafy relief plaque with laurel leaf frame. The high clock face with a white and blue enamel dial with gilt hands, framed with foliate scrolls. Below are heavy acanthus leaves and floral vines. A leaf and artichoke terminal. H. 31 1/2", L. 11 1/2", Depth 6 1/4"